Jonatan ‘Cactus’ Söderström told Eurogamer today that Dennaton Games had “barely begun working” on a new Hotline Miami. I’ve tried rephrasing the same news in a slightly more positive manner, though, and came up with this: there’s going to be a Hotline Miami 2. 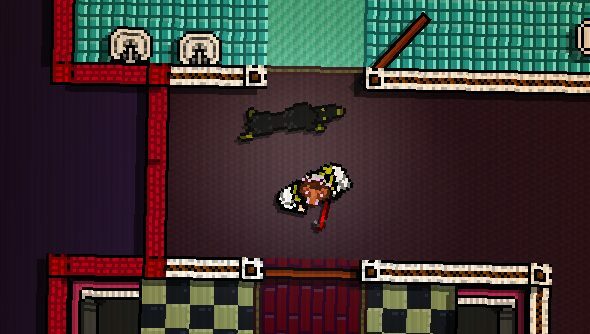 It transpires that the story-driven Hotline Miami DLC we heard about at the end of October has spiralled outwards so violently that it’s broken away from its mother game, becoming an independent sequel. “Yeah, it seems like it will end up bigger (in terms of the number of levels we’ve got planned) than the first, so it feels reasonable to release it as a full game rather than a DLC,” said Söderström. Hopefully one of the things Dennaton are currently patching is the way the game handles its Dobermans in relation to the Ted mask. While not the first occasion Söderström has worked on a sequel – that would have been his first-person LSD sim Mondo series – Hotline Miami 2 is certainly the first time he’s had to follow up a commercial success. How do you think it’ll turn out?